Happy Monday all! Summer is here. and I’m so thankful that we get to slow things down a bit. For me, summer is the time of year to kick back, take it easy and just enjoy being able to spend more time together as a family. 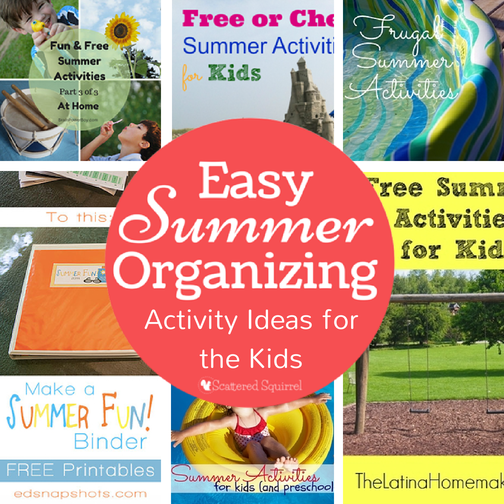 With that in mind, I wanted to share with you my ideas for Easy Summer Organizing, starting with Ideas for Kids Activities. Summer is all about kicking back, relaxing. For our kids, it is the reward for working hard throughout the school year. It’s their time to let their imaginations roam, free from boundaries. It’s about being with friends and making memories all their own. I don’t want to have to spend a ton of time planning activities and outings. I don’t want time constraints, and I certainly don’t want to over structure our summer break. Of course I also don’t want the “Mooooom, I’m bored!” soundtrack stuck on repeat all summer either. So where is the boundary between keeping the kids busy and keeping everything relaxed? To help foster my theme of easy summer organizing, especially when looking for things to do, I keep it super simple. I turn to my blog feed, because it’s pretty much a guarantee that I’ll find at least one new post in there with a great idea for a fun activity for the kiddos. And if that doesn’t work, I turned to my favorite go-to place for ideas… you guessed it, Pinterest! But for you, my friends, it’s even easier. Here are my top 6 favorite lists of ideas for fun activities you can do with the kiddos. This post is full of some great ideas for things you can do at home this summer. I love, love, love ideas that mean I don’t have to go somewhere, because you know what, sometimes you just want to be at home. Combine that with FREE activities to do at home, and it’s winning combo in my books. Again, Free or Cheap! (are you sensing a trend?) I don’t want summer to break the bank, and two months of on the go activities could add up pretty quick. This post has a fantastic list of different things you can do with or for your kids this summer. It’s all organized by category so it’s easy to scroll through and gather up some ideas. This one is another great post for pocketbook friendly ideas to help beat back the boredom this summer. This one is more of a general ideas, jumping off point list that sort of points you in the direction you want to go, but absolutely fantastic none the less. Ok, so if you’ve been following for a little while now you know I love me a good binder. When I saw this idea all I could think was “Oh my goodness, I need one!” Sometimes you don’t want to fire up the computer, or open an app, sometimes you just want a book you can take down and flip through. Or maybe I’m weird, but this is for sure something I plan to make up with my kiddo this summer, I’ll just skip the calendar part and use it as more of an idea bank. 5. 80+ Inexpensive or Free Summer Activities for Kids from Crystal & Co. This one is a fantastic collection of ideas. It’s divided into three different categories; Go, Make, Play & Do, so finding an idea is super easy. And lastly, but most certainly not least, this post is sure to give you some great ideas for things you and your kiddos can do this summer. I especially like the idea of Apple Camp. Being organized in the summer doesn’t have to be a lot of work, as long you have a few go to places for ideas you’re sure to find something that will be entertaining, fit your budget, and best of all, keep the kids from hitting repeat on the “Mooooom, I’m bored!” soundtrack! Inquiring Minds Want to Know: Do you prefer organization and structure with your summer vacation? Or do you take more of a go with the flow approach? 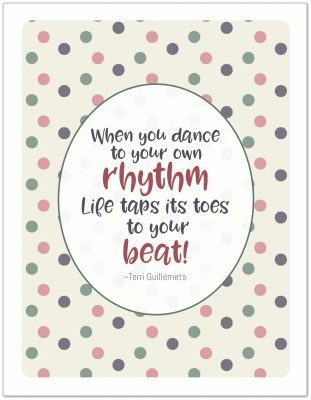 For more ideas checkout my Keeping the Kids Busy Pinterest Board. Follow Scattered Squirrel’s board Keeping the Kids Busy on Pinterest. I’m linking up at these great places.